The BOXWIDTHSCALE=value option specifies that the widths of the box-and-whiskers plots vary in proportion to a particular function of the group size n. The function is determined by value and is identified on the box plot with a legend if the BWSLEGEND option is specified. The BOXWIDTHSCALE= option is useful in situations where the group sizes vary widely. 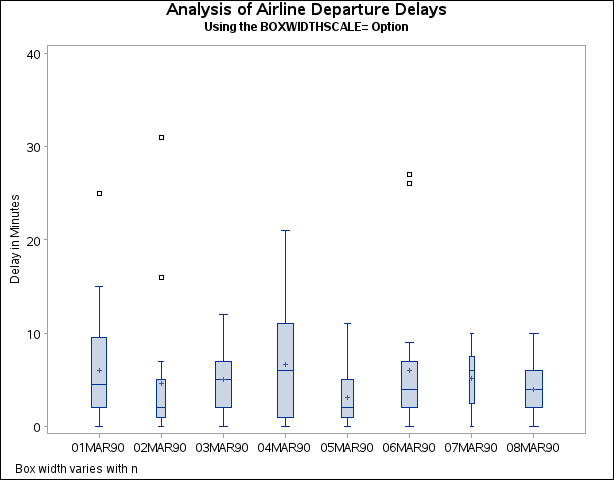 Output 28.5.1 shows the resulting box plot.